Renting farmland is fairly common in the agricultural community, but landowners and renters are frequently confused about prices to charge — or to pay. In a round-table format workshop, CCE CNY Farm Business Management Specialist Nicole Tommell spoke to attendees about things to consider and where to go for help when determining these prices. If you’re new to renting, you should take a look at several things before moving ahead. On the other hand, if you have been dealing with farmland rental for years it is important to keep up with ag assessments and possible changes in local codes. What are the current market rates and statistics for your area? Tommell pointed out that these facts change from county to county. Kristin Rumovicz, Farm Service Agency, Program Technician, Otsego County, reported that farm surveys taken in Otsego County show a large variation from $35-$110 /acre within the county. Tommell remarked that $45-$50 /acre were about average for the surrounding counties. Data compiled through Dyson, Cornell SC Johnson College of Business, chart 11-years of Farm and Sale data compiled from counties around New York State. These county charts and maps showed recent market trends and reflected how local economy has impacted the real-estate market and land value over those years. Tommell said the “rule of thumb” is that land is rented at 2-percent to 3-percent of the value per-acre. This means land valued at $2,000 per-acre would be rented for approximately $40 per acre. Tommell emphasized the importance of answering ag census calls and providing adequate and accurate information. Rumovicz explained that these numbers are used to design USDA programs to benefit farmers. Each county qualifies for different program funding guided by this information. The Agricultural Risk Coverage Program falls into this category. “I don’t think the farmers really understand how important that is,” commented Mark Crisman, of Springfield, Otsego County, NY. Other variables impacting farmland rental rate considerations include location, infrastructure and property enhancement or depletion. Fencing, buildings, water supply, land conditions — and even soil nutrients should be considered when pricing. Are you renting for pasture land for cow/ calf pairs or other livestock? Pasture land might be rented out by head of cattle/ per day, instead of rented by acre. Maybe you are renting for corn seeding or manure spreading. Will this impact the property in the future? Is it possible to get on and off the acreage with equipment as necessary? If the land is inaccessible the value diminishes quickly. Maintenance responsibilities and management practices should be clearly worded in the lease agreement. Make it official with a written, signed and dated document to assure avoidance of possible future confusion. Samples of lease agreements from the Cornell Small Farm web page were distributed to attendees. This requires a 5-year agreement. Tommell said she also always cautions folks to keep in touch with their tax assessor, as each assessor may require a variety of information. Your information should be kept current to correlate with your ag assessment. It is also important to consult with the local town board. Know your local regulations before you make any commitments. Several years of back taxes can be incurred for renting to businesses you are not zoned for. Solar farm activity was used as one example. Tommell advises landowners to carry insurance on rental properties to avoid and transfer risk. If someone gets hurt on your property or if you are renting a barn and livestock are injured, you may be held liable. “That could really break somebody if they don’t have the right insurance.” Be sure to consult with your insurance agent before renting. Consider including a clause in your agreement contract stating that the rental property will be left in as-good, or better condition than at the time of the leasing. 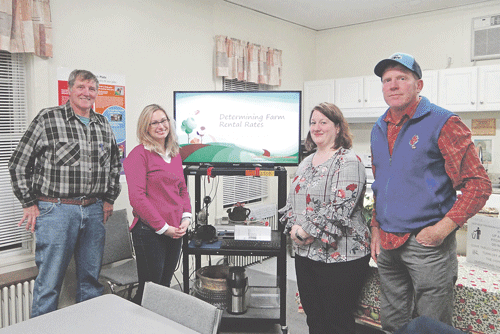 Cornell’s Small Farms’ network helps to connect producers. Tommell remarked that by speaking with producers, she is better able to assess farmland supply and demand in New York and hopes to add more current information to the database. For more information go to https://cnydfc.cce.cornell.edu/.